A group of rotorcraft original equipment manufacturers (OEMs) and military and commercial operators have come together to review the current state of mechanical diagnostics (MD) for on board rotorcraft Health and Usage Monitoring Systems (HUMS). HUMS has become an integral part of the modern rotorcraft both in commercial and military operations to enhance safety and enable Condition-Based Maintenance (CBM). Commercial oil & gas operators depend on the HUMS vibration monitoring and MD to comply with regulations and customer requirements for ensured safety of off-shore transportation. 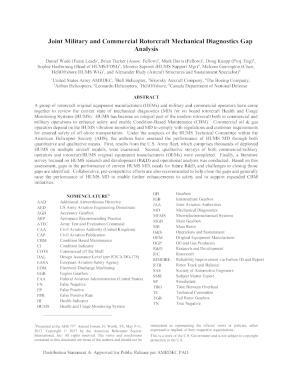 Under the auspices of the HUMS Technical Committee within the American Helicopter Society (AHS), the authors have assessed the performance of HUMS MD through both quantitative and qualitative means. First, results from the U.S. Army fleet, which comprises thousands of deployed HUMS on multiple aircraft models, were examined. Second, qualitative surveys of both commercial/military operators and rotorcraft/HUMS original equipment manufacturers (OEMs) were completed. Finally, a literature survey focused on HUMS research and development (R&D) and operational analysis was conducted. Based on this assessment, gaps in the performance of current HUMS MD, needs for future R&D, and challenges to closing those gaps are identified. Collaborative, pre-competitive efforts are also recommended to help close the gaps and generally raise the performance of HUMS MD to enable further enhancements to safety and to support expanded CBM initiatives.